Caption slip reads: "Photographer: Swaim. Date 1958-11-27. Reporter: Swaim. Assignment: Pilgrims, Claremont. 36: Miss Maud M. McGwigan, retired China missionary, left, and Miss Grace Towner, retires Turkey missionary, dressed as pilgrims, on way to church in autoette. 20: L. to R., Rev. and Mrs. A.A. Martin, Rev. Clarence F. McCall and Miss Lucia Lyons, and Rev. A.C. Hacker and Mrs. Hacker, walking out of Pilgrim Place gate on way to church. 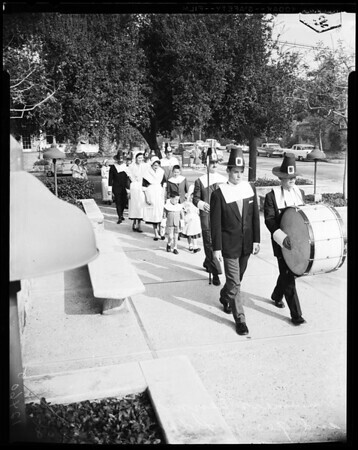 Led by drummers Dennis Running (with bass drum) and George Redmond (with snare), procession of 'pilgrims' from Pilgrim Place enter Claremont Community Church."